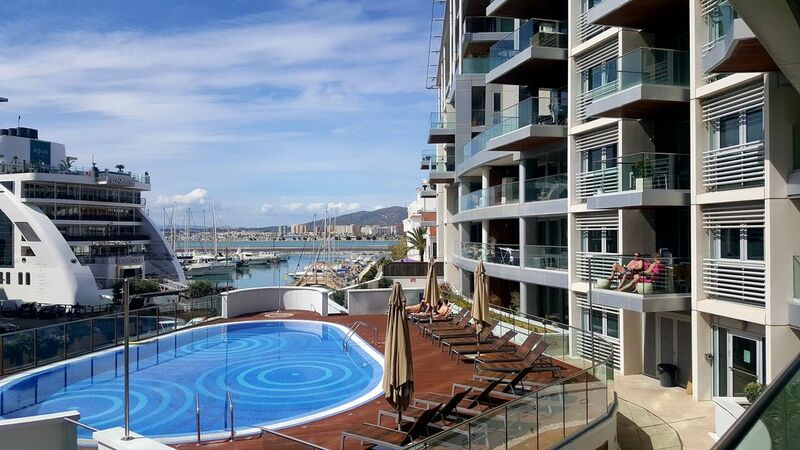 Right in the heart of Gibraltar's charming marina, Tradewinds was built in 2007 to a high standard by Taylor Woodrow. Our apartment has a pleasing view over the communal swimming pool and Sunborn hotel and Casino, with the Marina and Spain behind. Almost all the furniture and furnishings are new, and the apartment was completely redecorated recently. Solid wood floors, air conditioning, Samsung curved Smart TV, fIbre optic internet with over 200 channels are just some of the modern features of the apartment. I'm from Lisbon Portugal. It was my husband, who is British, who introduced me to Gibraltar. And fell in love with it straight away! So much so that we decided to buy a property and make it our home last year! We do like to travel a lot to see both our families, hence us deciding to rent it out, when we are away. The location! Its's great that I have almost everything that I need within walking distance. As this is mine and my husbands main home, you will see that we have good quality furniture and furnishings, that you don't always see on a rental property. Two remote controlled air conditioning units in the lounge, and one in the bedroom, it is communal and they set it for warm or cold. The conditioning serves as a heat pump during the winter months. Bed linen is luxury cotton percale. A change of bed linen is provided weekly for bookings over a week. Bosch combined washer dryer. Please note that as anyone who is familiar with these kind of 'combined' machines will know, it does not get items completely dry. One bath, one hand 'ribbed style' towel for each guest. Beach towels are provided. L shaped sofa, rug and coffee table. Bosch halogen electric ceramic hob. Fully fitted open plan kitchen with extractor and waste disposal system. Adjoining dining area with a round glass table 110cm diameter and four chairs. Over 200 channels provided including movies, sport and foreign language. Please ask for a full list, if interested. Playstation 3 which doubles up as a Blu ray/DVD player. Some popular Playstation 3 titles such as Virtua Fighter. The terrace has can be accessed from either the lounge or directly via the sliding doors in the bedroom. There is a wicker style table and two chairs. The communal pool is open from 10am to 1pm daily. It is accessed via a lift to the 1st floor. Please respect the rules for using the pool and surrounding area, which are located on the entrance door. A truly great apartment in an amazing location. A fantastic place to stay that has everything you need. The apartment was, clean, comfortable, stocked with a welcome package & basic essentials. Zuzanna; rep, was lovely & friendly, very warm and inviting. It was/is a perfect location to stay in, close to the marina, main street, shops, airport, won't ever stay in a hotel again in Gib. Hoping to return again next year, will definitely book again. Thank you! and a bite to eat.Would love to come back again.Thanks to Nadia for everything. This is our third stay at this lovely apartment. It has everything you need for a most enjoyable stay. The view from the balcony is beautiful and sunny too. Modern building with swimming pool in a great location central to everything. We enjoy our stay here every time we are in Gibraltar. Our stay in the flat was truly a pleasure with a very central position close to Main Street and its comprehensive shopping facilities and at the same time close to the marine pool and a great variety of quality restaurants and bars this pleasant accomadation benefited from air conditioning and was still quiet even with the buzz of activity around it and had a lovely sunny balcony . Difficult to beat in anyway and hopefully there will be a chance to return in the future..
We were mainly pleased with the property. -debris under coffee table although not sure what it was. -we didn't feel the cleanliness was as good as we would have expected. Not terrible but could have been better. - communication with the owners was good up until the time we paid the full balance. After that it was sporadic despite numerous emails to both owners individually. We were caught up in BA cancellations. Owners gave us a free night although we did arrive 2 days later than planned,due to flight cancellations. Had to chase refundable deposit, subsequently it was paid within a week. Please note that the £300 security deposit is payable at 8 weeks, along with the remaining 50% of the booking. The security deposit will be returned by bank transfer, a few days after the end of your stay, pending the a satisfactory report from our representative in Gibraltar. PLEASE NOTE THAT WE ARE CURRENTLY NOT ACCEPTING BOOKINGS FOR 2018 AND BEYOND.